Gadget Wizards for Wonderware® provides you with nearly 100 wizards that give your Wonderware® InTouch applications a real world look and feel. Gadget Wizards are perfect for applications where you are trying to gain operator acceptance by making the InTouch screens “feel” like a control panel. The controls are even sized with use on touchscreens by gloved operators in mind. 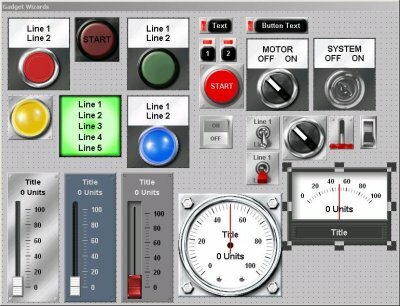 You won’t find any of these controls in the Reichard Symbol Factory or in the standard InTouch Wizards -- Only with Gadget Wizards do you get such realistic, powerful objects for your InTouch application. Gadget Wizards for Wonderware are highly cost-effective because you only need to purchase a license for your WindowMaker development station. No licenses needed for WindowViewer runtime stations. If you have multiple development stations, volume development licenses are available. Each wizard is designed to tightly integrate with InTouch the way all standard InTouch wizards do. Pick the wizard, place it on a window, and from the Wizard setup dialog, pick the InTouch tags to tie to the object from the Tag Dictionary, set the object appearance, and you are done.